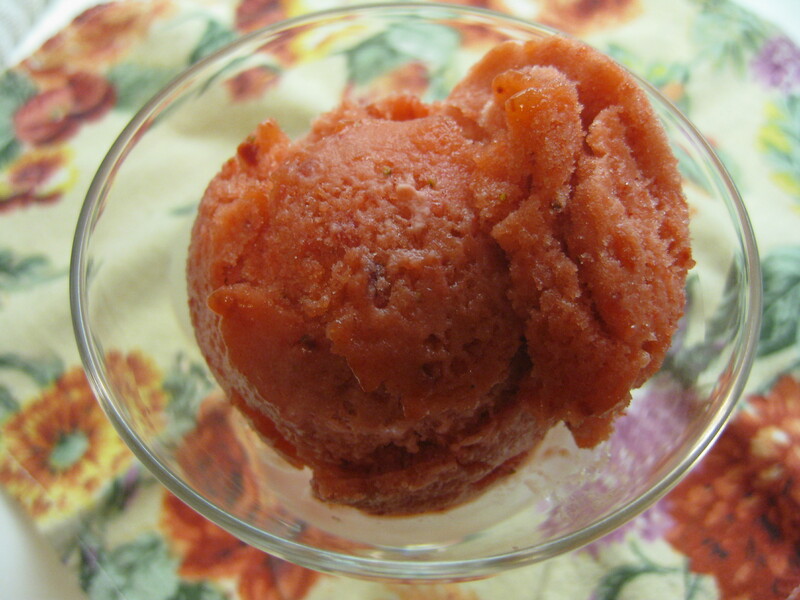 I recalled from last year’s excellent rhubarb sorbet that rhubarb creates a good texture and the addition of a little corn syrup allowed a creamy and non-icy texture. This year, I decided to incorporate strawberries and spice it up with ginger. I often see candied ginger added to jams and other concoctions, so I “candied” fresh ginger in the simple syrup used to poach the rhubarb. This was piquant and refreshing, great for the last sorbet of spring. Combine the water and sugar in a saucepan and bring to a boil to make simple syrup. Add the ginger and simmer for 5 minutes. Add the rhubarb and simmer until soft and falling apart, about 5 minutes. Remove from the heat and set the rhubarb aside to cool. When the rhubarb mixture is completely cool, add the strawberries and corn syrup and puree the mixture in a food processor until smooth. Refrigerate until very cold. Process in an ice cream maker according to the manufacturer’s directions. Makes about a quart or a little more.